There's no need for that! Jhonen Vasquez has been making Invader ZIM comics since 2015. I really need to acquire them for myself when I can afford it. 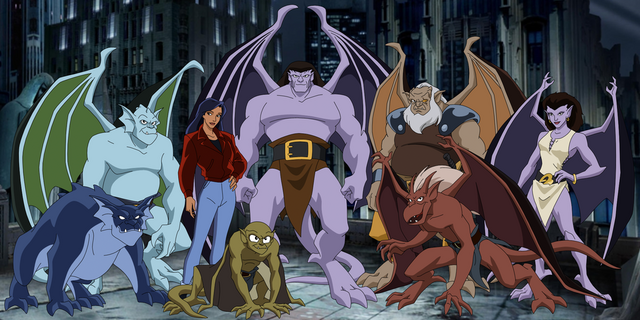 Gargoyles never got the season three it deserved other than the first episode. I'd love for the comics to be animated. I'd be interested in a reboot of some Klasky-Csupo shows, like Rugrats, Wild Thornberrys, As Told By Ginger, Rocket Power, etc. A request if I may: Put Happy Tree Friends back on American TV! I vividly remember watching 22-minute episodes on Netflix and wondering where the hell they came from? Also, wouldn't mind a Courage the Cowardly Dog reboot just please don't pull a TTG. Saw the teaser trailer for the new She-ra series and I think it's got potential. Well, following the successful reboot of Duck Tales, which if you haven't watched the first episode yet I suggest you do (it's free on youtube and amazon), I'd like to see a Duckman reboot and a Darkwing Duck reboot. Never really watched Duck Tales (and don't think I've seen Duckman at all) but I'll second Darkwing Duck since that was my favorite show as a kid. And-- this might not be too popular an opinion but I wouldn't mind necessarily mind seeing a Cowboy Bebop reboot. It's a classic so I think people would be afraid they'd ruin it, that it kind of had a great run and leave it be, but while the concept was right up my alley and it had a few terrific episodes (including the ending), a lot of the individual episodes were kind of meh/I could take it or leave it/just sort of okay for me. Maybe with more of a developing story, or simply more 2-part episodes or whatever.